The Trump administration has unveiled its latest attempt to target sanctuary cities that are refusing to help federal agents detain and deport undocumented immigrants. On Monday, Attorney General Jeff Sessions said the Justice Department would withhold billions of dollars in grants to law enforcement agencies in sanctuary cities. The Trump administration has unveiled its latest attempt to target sanctuary cities that are refusing to help federal agents detain and deport undocumented immigrants. 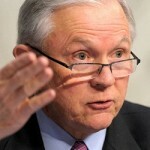 On Monday, Attorney General Jeff Sessions said the Justice Department would withhold billions of dollars in grants to law enforcement agencies in sanctuary cities. In response to Attorney General Jeff Sessions, New York Mayor Bill de Blasio, Boston Mayor Martin Walsh and others vowed to defy the order and remain sanctuary cities. Texas U.S. Magistrate Judge Andrew Austin said in open court that federal agents had alerted him that ICE would be targeting the area of Austin, Texas. The raids would be retribution for Travis County Sheriff Sally Hernandez’s new policy that limited cooperation between local and federal authorities. Austin City Councilmember Gregorio Casar gives an update. When he first won election in 2014, he was the youngest councilmember in the city’s history. In 2007, the New Haven City Council and mayor agreed to adopt the first municipal ID card in the nation. The move sparked fierce backlash from federal immigration authorities. Forty-eight hours after the Board of Alders approved the new ID cards, ICE conducted the largest raid in the history of the state, sweeping across immigrant neighborhoods, kicking in doors and arresting 32 people. Speaking on how the community fought back against the illegal raid is Michael Wishnie, clinical professor of law at Yale Law School, where he oversees the Worker and Immigrant Rights Advocacy Clinic.